The Partiologist: Mini Chimney Cakes! As a child, I have the most magical memories of Christmas, it was simple, but simply wonderful. My family consisted of my mom, dad, two sisters and grandparents. On Christmas Eve we would go to our church Christmas program, come home and open gifts. I could list my favorite gifts, but I don't think you care about the Incredible Edible Machine or the Vacuform or even the Fun Flower Machine...not to mention my sister's Wood Burning Machine. Yeah, those were some of my favorites. I'm pretty sure they don't make them any more because of all those safety regulations...it's a miracle I'm still alive! Now, you might want to take a seat for this revelation, I didn't believe in Santa...GASP! I pretended in Santa. Are you in shock? Santa always appeared at our school Christmas program and I thought he was a great guy and all, I even told him what I wanted for Christmas just for fun. 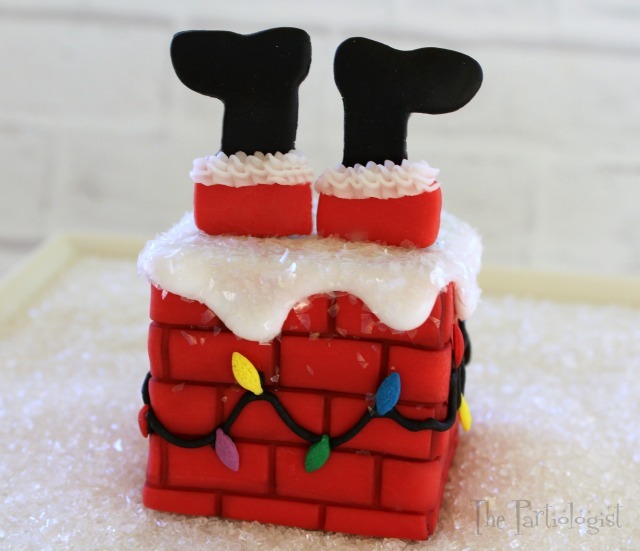 I still pretend in Santa, which is why I made these cute little mini cakes, just for Santa. 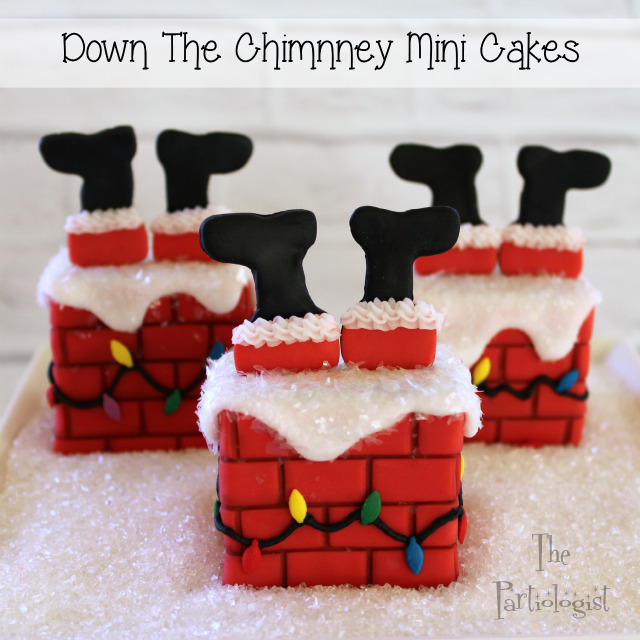 Down the Chimney Mini Cakes! Whether you believe or pretend, the little cakes are magical. Because you can eat every part! It's hard to believe isn't it, that you can eat this chimney? The lights were strung with ease. No burnt out lights here! After baking and cooling your brownies, cover with chocolate ganache and remove from pan. Cut with a knife or to make sure each is the same size, mark the brownies with a square cookie cutter. Stack two brownies on top of each other. Now it's time to lay the brick. First roll out red fondant into a long strip. Press with brick impression mat. After making the first impression, lift the mat and line it up with the bricks and press again, making a long strip of brick. 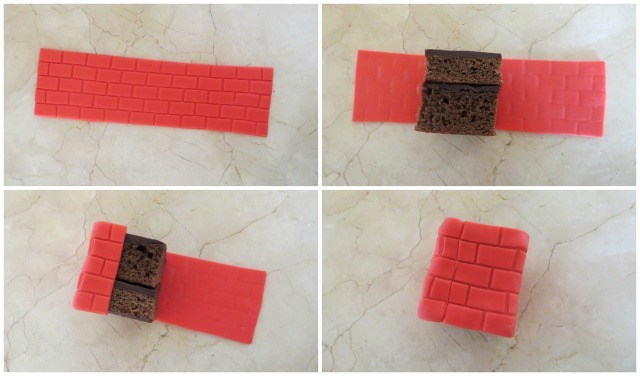 Cut the strip of brick to fit the brownie. Wrap the brick fondant around the stacked brownie. To make the bricks stand out, I brushed edible chalk into each line. Now it's ready for the snow. Making it snow on the chimney was easy. Pipe glaze icing around the top of the brownie, letting it fall over the edge. This is where consistency is key. The icing cannot be too thin or it will run and make a big mess. If it's too thick, it won't fall down the sides. So you might want to practice a little so you don't mess up your chimney, like someone I know. Time to make the snow glisten. Over a paper plate, sprinkle frosty flakes across the snow. 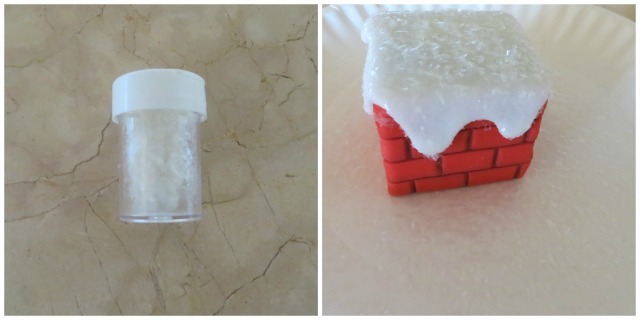 If your snow has set, use a paint brush (used for food only) and brush with a little vodka and the snow will stick. Now we can make Santa's boots. 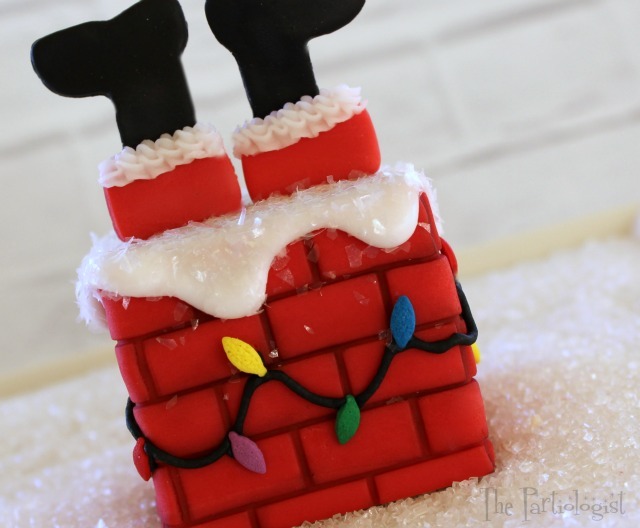 Roll and cut black fondant with the mini boot cookie cutter. 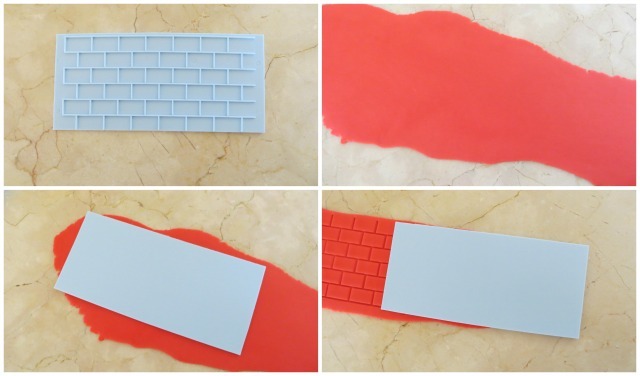 Roll and cut the top of the boot with red fondant. Just enough to cover the top of the black fondant. 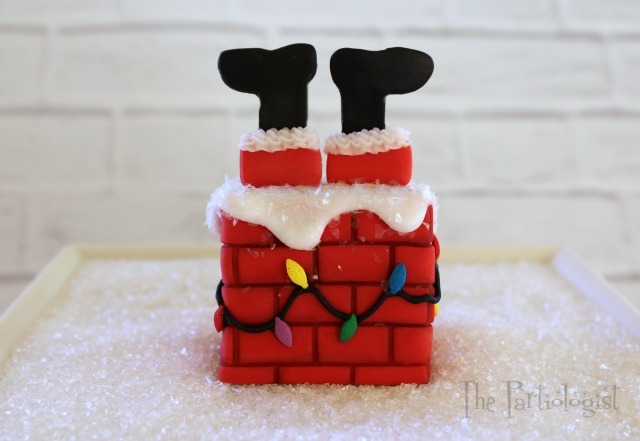 Place the red fondant on top of the black boot. Turn the boots over and add a toothpick and a bit of black royal icing. Let the boots sit until completely dry. Once the boots are dry, turn over and pipe a squiggle of white frosting across the bottom of the red fondant. Now you've got the fur on Santa's pants. Insert the boots into the top of the snow. 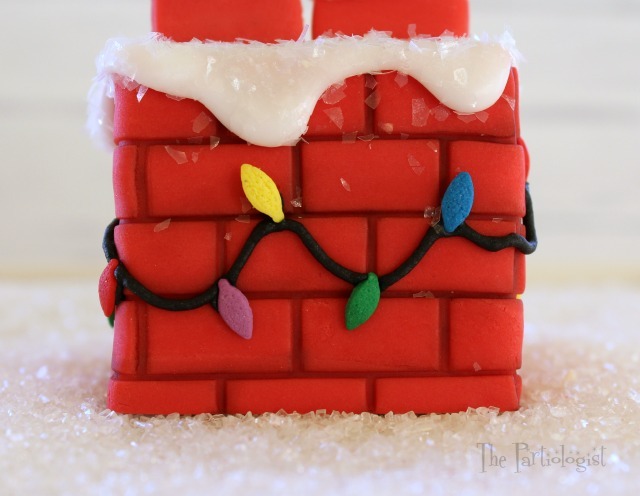 With a round #2 decorating tip, pipe a string of black frosting around the chimney. Add a little black dot and place an edible Christmas bulb. The kind that never burn out. Can you tell I have had issues with Christmas lights? Your friends will tilt their head in disbelief, because this is edible. Thank you so much for the sweetest comment - Happy Holidays to you too! Thank you, yes it is the best memories!! Piping is the enemy. LOL. Thanks Lisa! Simply adorable!! Merry Christmas Kim! Thank you Rose, Merry Christmas! Thank you so much, weren't those toys great?? You didn't believe? I totally did and still do! These cakes are so cool. I know Santa would approve. This is over the top adorable!!! AND I actually saw these in person...since I'm one of the "sisters" she mentioned! Everything Kim makes is beautiful in my opinion! I do not have even a small portion of her creative talent, but I do get to enjoy some of the creations from her kitchen!!! I chocolate dipped and decorated a few pretzels today with my granddaughter for her birthday party next weekend… And since she is only eight years old, she thought they were wonderful! The whole time I kept thinking Kim would redo them!!! I enjoy looking at everything you make...please keep sharing...I know you'll be famous someday!! !